Clip du jour. Clip of the day. Cale Avery Schindler comes through with a great edit that sees him shredding everything in site. Whether it’s street, the skatepark, a race track, dirt jumps…you name it…no terrain is safe is from Cale’s unique brand of radness. Filmed and edited by Pdog (who’s no slouch in the riding/edit department either) this video should get you stoked to ride, for sure. Tags: Cale Avery Schindler, Pdog, Shredding on a 24"
Joined by fellow R&D test rider (and flatland legend) Leif Valin, Taj highlights how they test both their prototypes and current products. 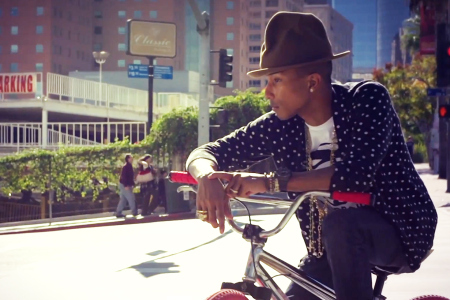 Even the 26″ Taj cruiser makes an appearance! If this video doesn’t get you smiling, I don’t know what will. 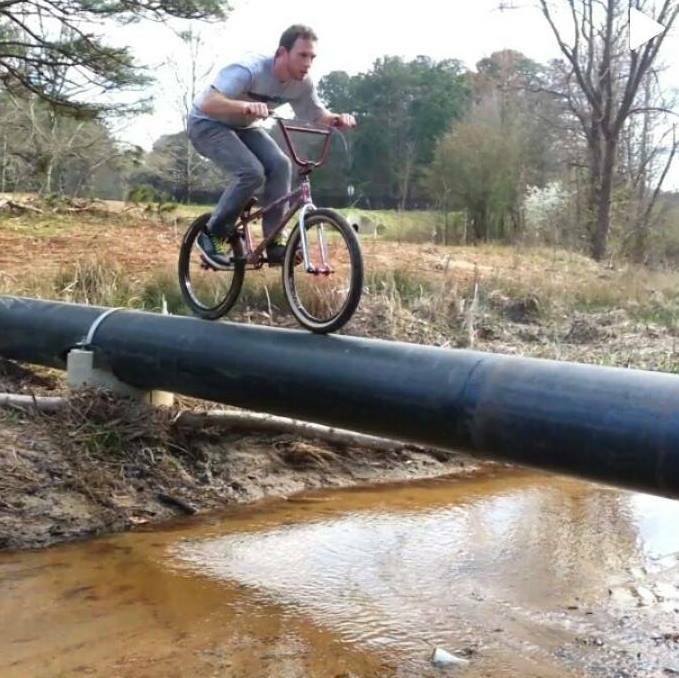 Which inspirational thought (a,b, or c) do you think was going through this guy’s head before he attempted this? From award shows to curating design exhibitions and everywhere in between, Pharrell Williams is in the media spotlight in a big way. But did I expect to see him show up in an edit with Nigel Sylvester talking BMX? This follows on the heels of last year’s announcement that the pair were collaborating to create Brooklyn Machine Works complete BMX bikes. Looks like a pretty cool project for the both of them. I think we’re in for some cool stuff from these two. In terms of riding spots and parks, Toronto seems to get the most attention for it’s indoor bike park, Joyride 150 (and the crazy edits it spawns). However, that may be changing this year. At the recent Toronto BMX Jam, I learned that the city of Toronto is planning a new outdoor public bike park that is set to open this summer! 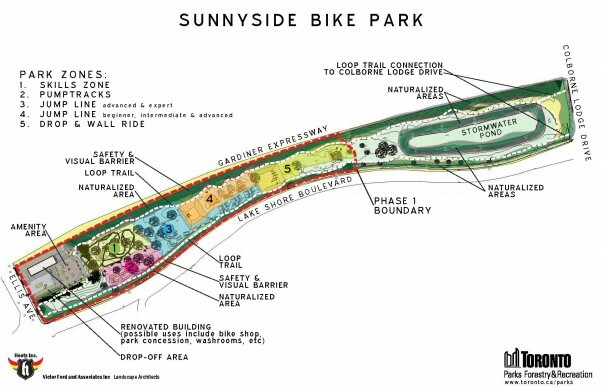 According to the City of Toronto website, the Sunnyside Bike Park will feature: a skills trail, pumptracks, a wide variety of jump lines and a wall ride. And, to keep it family friendly…benches, picnic tables, and drinking fountains are going to be added as well. This is in addition to the Centennial Park BMX Park also under construction just outside of Toronto. This facility is scheduled to be completed this year and used as a venue for BMX racing portion of the 2015 Pan American Games. I have my fingers crossed that the track will live on after the games as permanent track for the Toronto area (it would certainly be a lot closer commute than my current “local” track). 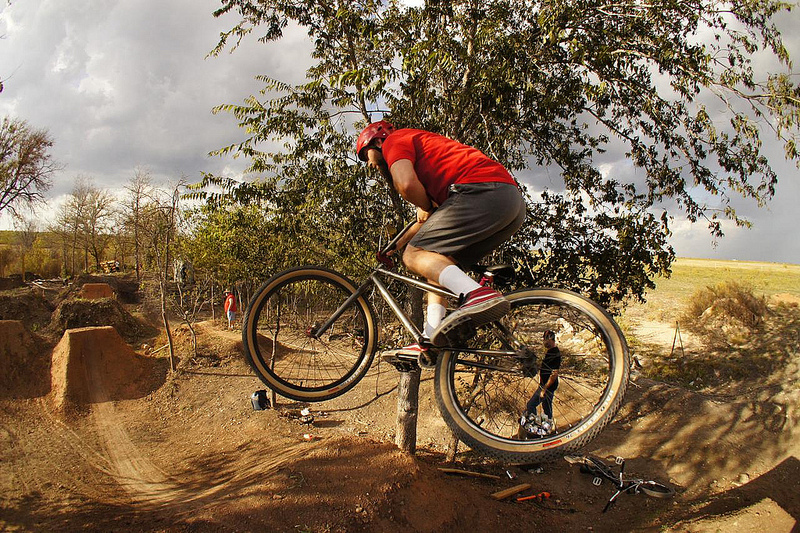 I’m so looking forward to the ribbon-cutting ceremonies of these two bike parks. I don’t know if this qualifies for a “Throwback Thursday” post but I’m just going to roll with it. About this time last year, I was planning a trip to Austin, TX . I ended up having an great time. One of the highlights of that trip was getting to ride with Buddy Sardenga at Walnut Creek (and having a few PBRs at the bar afterward). This 2012 picture of Buddy shredding the Allied Compound (that I found over at BikeMojo) brought back some great memories of that trip. Thanks for showing me around Buddy. While this isn’t cruiser news, I have to share the Justen Soule-filmed highlights video from the Toronto BMX Jam. 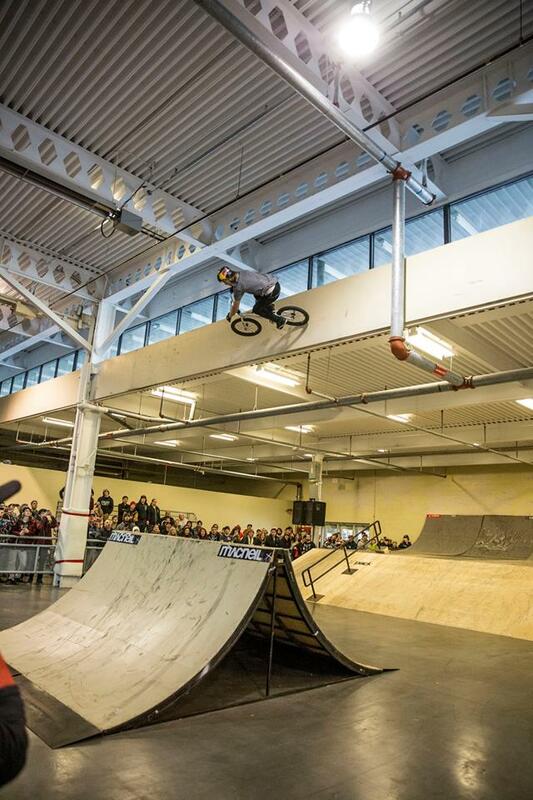 The Toronto BMX Jam is one of my favorite events of the year and the 2014 did not disappoint. The jam not only showcases some awesome riding, it’s a great opportunity for the BMX community to get together and have a good time. But seriously, check out the bangers in this clip…especially the one at the end. Wow.